HP's enterprise-class Ultrabook offers ruggedness and security, with very little extra software to clog the machine. Dr. Jeffrey Sheen is the supervisor of enterprise architecture services at Grange Insurance in Columbus, Ohio. The HP EliteBook Folio 1020 G1 Ultrabook’s low weight belies its ruggedness. Made of high-grade aluminum with a magnesium alloy base, the device is so tough that it passes 12 military-grade specifications for durability. HP delivers everything a user could want in an enterprise-class Ultrabook: a sleek appearance, bright display and ample power. The Folio 1020 G1 also has everything the IT department needs: ruggedness, security and very little extra software to clog the machine. Fingertips will fall in love with this Ultrabook, which is a delight to use. The Folio 1020 G1 sports an HP premium backlit keyboard, and each key is measured to take the exact same force to activate, whether it’s a small letter–sized key or the space bar. Because of this, you’re less likely to miss keystrokes on the Folio than on other notebooks, or have autocorrect make an unwanted substitution. The glass ForcePad is more than a normal touchpad pointing device; it can detect the amount of force fingers apply to the pad and enter a corresponding left or right mouse click. There’s even a software setting to have the device emit an audible click. 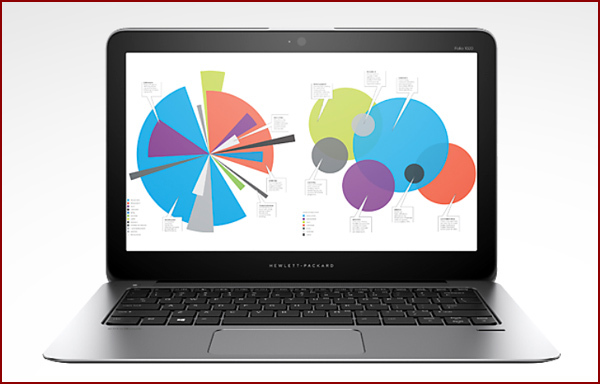 Because users will carry the Ultrabook everywhere, it needs good security capabilities — and HP delivers. Besides the standard physical lock slot and Trusted Platform Module support, HP has also installed a fingerprint reader and HP SureStart software. HP SureStart is a self-healing BIOS protection mechanism that compares the BIOS with a gold-standard version. If it’s different or has been altered, the software reverts to the gold standard before booting. This should help prevent certain notorious malware from getting into the Folio 1020 at its lowest levels, securing data at another level. The EliteBook also offers more interface ports than the norm for notebooks. It includes two USB 3.0 ports (one on each side), a full-sized HDMI port and microSD slots. A thin, proprietary docking slot on the right side can connect to a supplied RJ-45 Ethernet port and VGA port dongle, or to HP’s EliteBook UltraSlim 2013 docking station that side-mounts to the notebook. This docking station can also be used with other HP side-mounting docking ports to keep things simpler for the IT department. With such a mobile device, battery life is critical. But with a low-voltage CPU, fanless operation and an LED backlit display, the Folio 1020 G1 doesn’t require much power; in designing the unit, HP emphasized weight over battery life. We tested the battery under two different types of usage: continuous playback of an HD movie and normal office productivity use. The continuous playback netted an average of 5 hours and 19 minutes of battery life; under normal office use, the battery lasted 7 hours and 43 minutes — not quite a full day, but enough, if users give the Ultrabook a quick charge at lunchtime.